While on a girls-day only shopping trip with two of my closest friends, we were talking about shopping with kids. We laughed about nightmare trips and talked about how much easier it was to just leave the kids home sometimes. 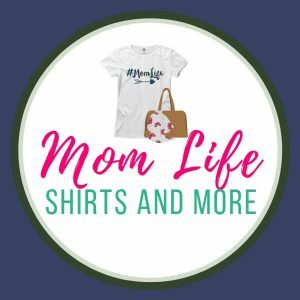 Being that I have four kiddos and have been a mom for nearly a decade (oh my gosh, I may have teared up a little), I have a lot of experience shopping with kids. While I have become a huge fan of online shopping (thank you Amazon Prime! ), most of the time I’m heading out the door with 1-4 kids in tow. 1. Prepare a list and plan your shopping trip. I can’t stress enough how important planning is. Before I even attempt to shop, I plan my whole trip and make a list. That way, I know where I’m headed and what I absolutely need/want. Doesn’t mean I have to stick to the list (you never know what you find in clearance aisles!) but it does mean I know which stores will be a quick trip and which ones will a bit longer. I tend to go to the stores that will require more time first, so if the kids get cranky, I can hop in and out of the quick trip stores without major issue. I also check my shopping apps, like the rebate app Ibotta (referral link) or Cartwheel before I head out. If you’re inclined to use printed coupons, prepare those as well. I try to plan my shopping trip when I know the stores won’t be so busy as well. Early mornings work around here, as long as it is not Senior Citizens Day. I avoid that day like the plague. But really, the best times to shop are usually between 8 am and 3 pm, when most people are at work or school. 2. 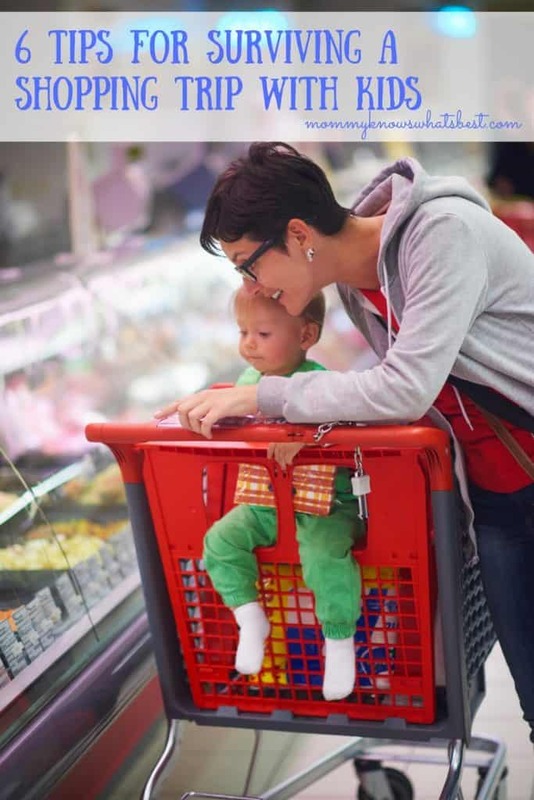 Go shopping when your kids are rested. Kids who have napped or who had a good night’s rest are easier to manage than kids who are cranky because they are tired. Try to go early in the morning or after naptime when your kids are rested. If you have a baby, going during naptime sometimes works as the baby usually sleeps during the shopping trip. When my youngest was an infant, I would go during her naptime and she would sleep in the baby carrier as I shopped. 3. Feed kids before shopping. Hungry kids can get cranky really fast, so feed the kids a healthy meal or snack before going shopping. It might even help to bring along a small snack and a sippy cup of water if it’s going to be a long shopping trip. 4. Set clear expectations with the kids. Before we head out, I explain to the kids where we are going and what I expect from them. This works wonders, even with my four year old. My kiddos know that they need to stay near the cart and look with their eyes, not with their hands. They know that they won’t get everything they point out (ie toys), but we can think about putting it on a list for a birthday gift. They know that sometimes we have time to look at the toys, but other times we don’t. 5. Involve the older kids. Involving the kids gives them something to do, which prevents boredom and whining. If your kids can read, give them the list and let them help you find what you need. Tell them what’s on the list and let them point it out to you if they can’t read. 6. Be prepared for a quick exit. With kids, especially young kids, anything can happen. Just know that at some point, you may need to exit a store quickly, with or without purchasing anything. Little kids have unpredictable moments, like meltdowns, illness, or even dirty diapers. If you understand that one or more of these things could happen at any time, you’ll be less stressed when it does happen and you need to react fast. Do These Shopping Tips Work All the Time? Kids are unpredictable. Life is unpredictable. There’s no guarantee that these tips or any others will work all the time. The tips above are for when you have time to prepare. Keep a small “shopping bag” by the door or in the car. In the bag could be small non-perishable snacks and something, like a small book or toy, that will keep your child entertained while you shop. Keep it quick. Just running to Target for diapers? 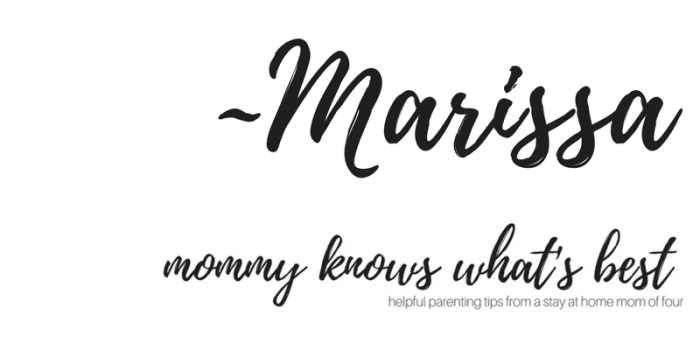 Resist the urge to browse through the dollar aisle or even the entire store (c’mon, you know you do it sometimes), even if your child is content at the time. Keep the trip quick since your child might not be prepared for a longer period of time. What are your tips for surviving a shopping trip with kids? What works for you and your family? Is there anything I missed? Leave a comment below! Hi Marissa, Your tips are very good. I was remembering when my girls were little, many many years ago, and I had to take them shopping. Mostly grocery shopping. I don’t remember what I did when they were babies, but when they were just starting to read, they loved the coupons so I gave them a couple each and when they spotted the items they always thought they won a prize. lol You also have a lot of patience, I’ve seen you with them and know that for a fact. You gave great stopping tips. Great idea to check for coupons while the kids are looking at toys! Keeping them busy and involved is definitely the best thing for us. The next best… snack, snacks, and… all the snacks! Haha. Food always saves us from meltdowns! We also always bring along a toy/book that they love and will keep their attention. I just recently wrote a blog post on “6 Ways To Keep You Children Happy While Shopping”… 6 must be the magic number! Haha. When I came across yours I had to check it out and see how similar our list were. Great post! That’s too funny! I’ll go check yours out now! I love these tips. The only thing I can add is never take a child who is in the middle of potty training shopping unless you want to stop and take said child to the bathroom every twenty minutes. These are great tips! I had five children and it was usually a challenge when we were all shopping. My daughter has three and I will pass these on to her. Thanks! Shopping with kids is always hard and challenging, thanks for your tips.